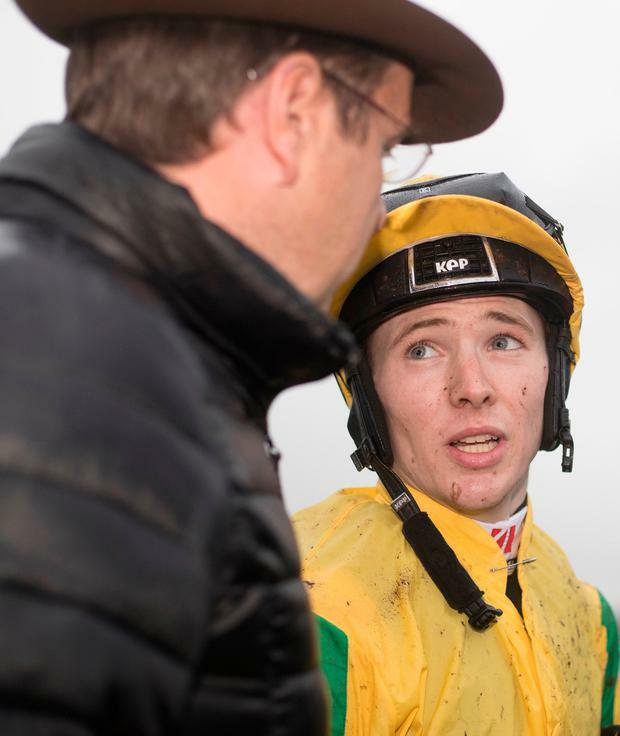 Colin Keane extended his advantage in the Irish Flat Jockeys Championship to seven over Pat Smullen and was cut to odds of 1/20 with Paddy Power to claim the title following a treble at Naas yesterday. Trainer Ger Lyons, who supplied Keane with all three winners, described it as "a good day in the office for everyone involved" as Keane pursues a first championship and looks to have a lead that is close to unassailable, with the season ending in Naas on November 5. There is no Flat action again until Friday at Dundalk but with Lyons' horses showing no sign of stopping, following a double at Cork on Saturday as well, Keane is in an extremely strong position to see off the nine-time champion. The highlight of the Lyons treble was the victory of Elegant Pose, a half sister to stable star Brendan Brackan, who won the feature race at Cork on Saturday. Elegant Pose won for a third time in just four outings but victory looked unlikely when she was shuffled back turning into the straight. However, she came with a renewed effort inside the final furlong and got up to win right on the line, denying Smullen on Dermot Weld's Making Light. "I got a great kick out of that, because it never looked likely," said a clearly thrilled Lyons afterwards. "I got some pleasure from Brendan Brackan winning (Saturday) but that nearly equals it. She can only improve with a winter on her back and we can dream about her next year now." The first leg of the Lyons/Keane treble came in the prestigious Birdcatcher Nursery as Moonlight Bay made a winning debut for new connections. Purchased at the Goffs Sale on Irish Champions Weekend, the filly had previously raced twice, winning a Naas maiden for Kevin Prendergast, and landed some nice bets to win the Birdcatcher at 9/2 from earlier quotes of 8/1. Another stable newcomer, Mustajeer, brought up the treble as he justified stable confidence to claim his first start in Ireland since being bought out of Owen Burrows' by shrewd owner David Spratt. There was some consolation for a disappointing season for Dermot Weld and Pat Smullen who won the Forans Equine Auction Series Final race of €120,000. Yulong Gold Fairy looks a nice prospect for next season after winning the competitive contest by six lengths and Weld is aiming at a Guineas trial for the filly next spring. Smullen, who also misses a day through suspension, can now be backed at 8/1 to claw back the deficit and win a 10th championship. Meanwhile, at Cork, the fantastic run of form for Philip and Luke Dempsey continued with Teacher's Pet giving the trainer an eighth winner since the start of last month. Teacher's Pet was a second winner of the day for owner JP McManus, as the classy Ballyoisin won the feature coopsuperstores.ie Handicap Chase for Enda Bolger and Donie McInerney.